Valid On Rentals, Not Purchases. Rent and Save Up To 90%. Want to get rid of that huge textbook bill at the bookstore? Rent them at BookRenter.com instead and use the savings for something else – something equally important and responsible, of course. To save even more, use a BookRenter.com coupon code to get those books that will lead you to making a fortune, and/or making the world a better place. Education requires textbooks. No getting around that. Yet. Maybe never. In any case, right here, right now, BookRenter.com lets you rent your textbooks rather than buying them. This saves you money. Lesson learned. Finding the textbook you need at BookRenter.com is quick and easy, with more than 5 million titles to choose from. Yes, 5 million. Odds are, they are going to have what you need. Search by ISBN, Author, or Title – totally up to you. You can rent for up to 125 days with an option to extend, and you can choose to actually buy the book at any time. As you might expect, they make shipping & returns as efficient, dependable, and hassle & problem free as possible. This is how they do business. This is their lifeblood. They is real smart over there at BookRenter.com. Prolly cuz they read some of them there books they have themselves. Books are wonderful, even when you’re forced to pay for them. Luckily, you can enrich your mind while saving some money by using a BookRenter.com coupon code to get the ink on paper that will feed your head. College is already expensive enough without pricey textbooks. This semester, try renting your books with BookRenter.com instead of buying. Save your cash for a fun night out, instead! Follow these directions to use a BookRenter.com promo code and get grade-A savings. Find a good BookRenter promo at CouponPal.com and click either "Get Deal" or "Get Code." Some coupons don't require a code, and you'll just be redirected to BookRenter.com to get automatic savings. 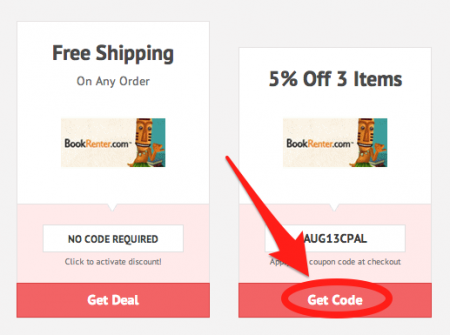 If you chose a coupon that does require a code, a window will appear containing the BookRenters promo code. Copy it so that you can use it later. Next, find the books you need at BookRenters.com. You can search by title, author, ISBN, or subject. Once you find the textbook you need, you can select different rental terms, or you can choose to buy the book. Then go to your shopping cart by clicking the shopping cart icon in the upper righthand corner of the page. Check over your cart and make sure that everything is correct, then click "Checkout." After you click "Checkout," you'll have the opportunity to create your own BookRenters account. The account is free and quick to make. Once you've either signed into your account or created it, it's time to enter your coupon code for BookRenter.com. 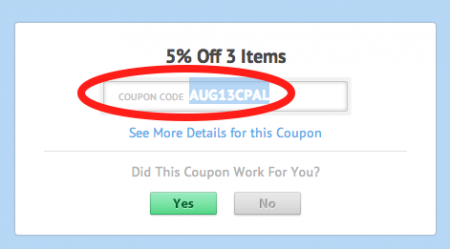 Find the box labeled "Coupon Code" on the right side of the checkout page. Enter your BookRenters.com promo code here and click "Apply." You should see your discount appear in red. You're almost done! Now you just need to enter your shipping and payment information. Then submit your textbook order. Buying textbooks can be one of your biggest expenses as a college student. BookRenter.com is here to ease the burden of spending tons of cash on books you’ll only need for one semester. Rent your books, and use your BookRenter.com coupon code to save even more! Here are some questions you might come up with while searching BookRenter.com. Why isn’t my BookRenter.com coupon code working? If your BookRenter.com coupon code isn’t working at checkout, there are a few things you can try. You should look to see if there are any special restrictions attached to the deal. Expiration dates or minimum size orders can keep your BookRenter.com coupon code from being applied. You can reach customer service by calling 1-877-642-9313, Monday through Friday from 8 a.m. to 5 p.m. (PST). You can also email them at Contact Us. BookRenter.com currently accepts MasterCard, Discover, American Express, or Visa. They also accept debit cards with the logos of the previously listed companies. They currently offer free shipping on all orders! Unless you need your books shipped Express or Overnight, your shipping costs are completely free! Do I have to pay to ship my returned books back? You don’t have to pay for shipping to return your books either! You can easily print a prepaid label, and stick your books in the mail--making this process totally easy and free! What are the lengths of time that you can rent a book for? There are several different rental plans you can choose from: 30 days, 45 days, 60 days, Quarter (90 days), and Semester (125 days.) The rental period doesn’t begin until your books are actually delivered to you. There’s a reason they call them “starving students.” These days, students like you barely have enough money for food after you’re done coughing up tons of cash to pay for your textbooks. It can be even more frustrating when you’ve purchased a textbook you barely used or had trouble selling back after the semester was over. BookRenter.com makes it easier and cheaper to get the textbooks you need for school. Here’s how to rent your books in 3 simple steps. In the search bar on the homepage, type in the ISBN, author, or title of the book you’re looking for. You’ll definitely be able to find the book you need--BookRenter.com has a selection of more than 5 million titles! After selecting the book you want to rent, you can decide what kind of rental period you’d like to purchase. There are five rental periods offered: 30 days, 45 days, 60 days, Quarter (90 days), and Semester (125 days.) The rental terms will have the exact date the book is due back. You also have the option of buying the book for a lower cost. Then all you have to do is give your shipping and payment information to order the book. The best part is that the shipping of your book is completely free! You’ve read the book, aced your exams, and now you’re ready to return the text. This is also a super easy process. You simply need to print a prepaid shipping label from the site, and stick your book in the mail. You can use the box the textbook came in or a different one if you wish. If you need to extend your rental for any reason, you can purchase an extension or buyout. This rental period is for however many additional days you might need the book. And that’s it! Renting a textbook from BookRenter.com really is as easy as 1-2-3. 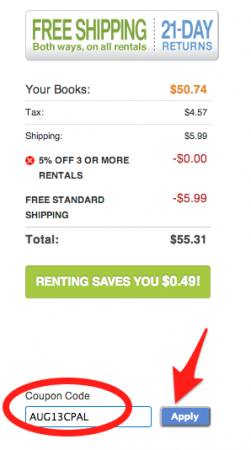 Plus when you use your BookRenter.com coupon code, you’ll be able to rack up even more savings!